And learned from me alone." found in Giorigio Vasari's "The Lives of the Artists"
Ponte Vecchio, the famous bridge over the Arno River: one of my first sights when I got off the bus in Florence! Most people reading my blog know that I went to go paint in Italy last July. It was such a rich, intense experience, that it has been taking me a long time to process it. I've been doing it in stages (see: Story of My Trip to Italy: Part 1 and Part 2. Now, in Part 3, I will tell you about my first visit to Florence, which was a field trip with the other artists in the JSS program in Civita. First, I got off the bus and immediately found an amazing gelateria. Gelato is like ice cream, but better. Melone was my favorite flavor! I did a little pencil sketch of The Expulsion (below). Today I went to the Capella Brancacci in Firenze, and saw "The Expulsion from the Garden of Eden." I cried. Kristen, my wonderful roommate, who was sitting and sketching beside me, held my hand. I confessed everything to her [things in my personal life causing me anguish.] She comforted me; I felt better afterwards. Later, I went to buy a postcard of "The Expulsion." The man who sold postcards in the foyer must have guessed my sorrow. We had a meaningful talk in Italian (can you believe I can do that!?) about the two Adam and Eve paintings, the one that had touched me so emotionally (Masaccio's) and also the other one by Masolino, which faced it across the chapel. The man selling postcards told me that Masolino's painting was more hopeful, because it caught the moment before the couple had sinned, before it was too late, and therefore there was tranquility and beauty in the image. He really wanted me understand this: he gave me the Masolino postcard for free, as a gift. How did he know I was sad? How did he know I needed that? Here you can see Masolino's tranquil fresco (LEFT), compared to Masaccio's agonized image (RIGHT). Anyway, my experience at the Brancacci Chapel really stuck with me. 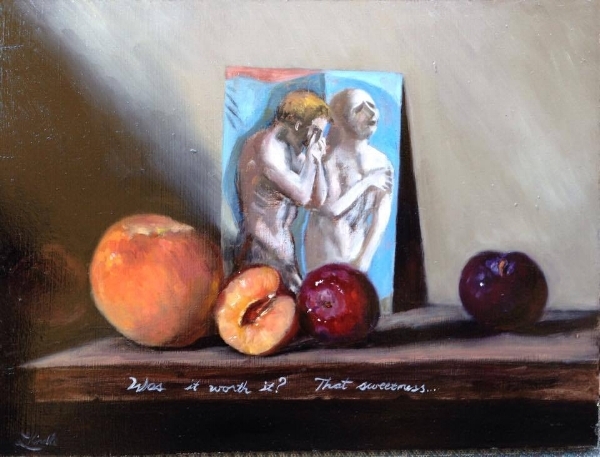 When I returned home from Italy, I made these two still life paintings as a response. Now, back to Florence... So, I left Kristen at the Brancacci chapel and found a cute little restaurant where I had this amazing lunch of spaghetti bolognese and prosecco. Mmmmmmm. I spent the rest of the afternoon wandering in the famous Boboli gardens. I was so full of good pasta, and the sun was so hot, that I found a nice quiet place in the shade under the trees and I took a nap! Can I Rest My Head on Your Shoulder... in the Boboli Gardens? Below...more photographs from the dreamy Boboli Gardens. Finally, I realized it was getting late and I didn't want to miss the bus back to Civita. I hurried out of the gardens and down the street, running into my artist friend Christina on the way. Together, we stopped for one final gelato indulgence before we said farewell to Florence! Epilogue: It wasn't my last visit to Florence! I returned alone, at the end of my art residency, to spend a few magical days in that beautiful city. See Alone in Florence (Italy Part 6)!